Again, thank you all for participating, and watch for Spec Faith’s Summer Writing Challenge later this year. For details about your prize, Sarah, please contact me via Facebook messaging, either at my personal site or through the Spec Faith page. I honestly thought any of our finalist might win, they were that good. And the close voting bears that out. So congratulations to the other finalists in the writing challenge for their excellent entries: Jay DiNitto and L. G. McCary. We had great participation in the writing challenge, in all phases: excellent, and numerous, entries, lots of readers in the first round who gave their feedback and comments, and a substantial number of voters (twice as many as in last year’s summer challenge) who chose the winner from our finalists. Thanks to you all for your participation. Contests like this writing challenge are fun. The thing that continues to amaze me is how varied the stories are even though they all begin with the same first sentence. We had such a wide range again this year. That shows a lot of creativity. The guard would never let me enter if he knew what I was planning. The airport inspector and guard would never let me enter if he knew what I was planning—and hiding. Right now I was being screened such at customs, for metals or explosive devices. What the airport inspector didn’t know was that a Bible was stashed away in the false bottom of my carry-on bag. In this country it was illegal to import Bibles. It was illegal to be a Christian. It was even illegal to own a Bible. That’s why I was helping my friend Edward smuggle Bibles. I held my breath as the airport inspector looked me over, hoping and praying he wouldn’t find me out. Or my secret. He patted me down and used his metal detector. Nothing. No metal, no explosive devices, nothing. He grunted. I smiled and moved ahead. I was through all customs, all inspectors, now all I had to do was figure out a plan and get the Bible to Edward. Suddenly someone rushed across the airport, someone I knew and recognized. The worst enemy of the Christians. He was known for hunting Christians down, reporting them to the authorities, and worse. I knew someday God would bring him to justice, but right now I was terrified and thinking that day would never come. Immediately the inspector officer rushed after me and caught hold of me. Amir stood by, smirking. “Explain yourself,” the officer demanded. I looked up and our eyes met, mine boring into Amir’s. Right then and there I knew he was sorry he’d betrayed me. Rebecca, I’m sorry I don’t have Facebook. Can I contact you via email? 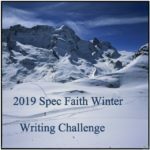 When is the Spec Faith Summer Writing Challenge?